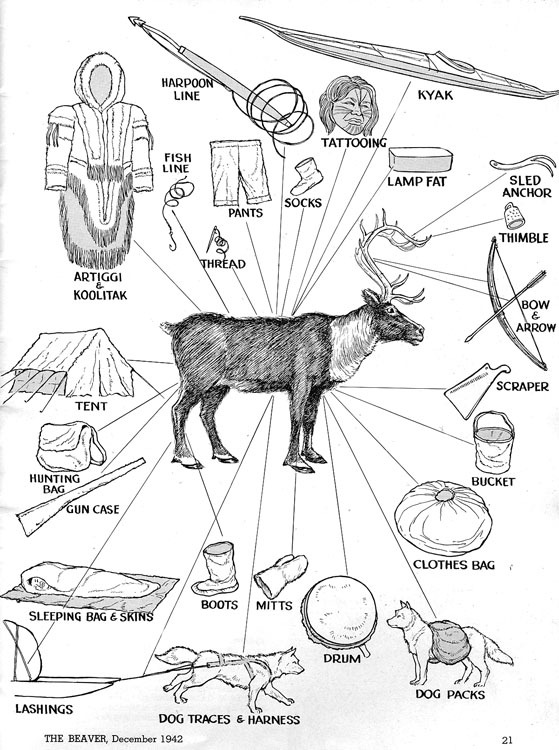 A detailed description of how the Inuit use the various parts of caribou to meet their survival needs. Transcription is not yet available. If you find that this print version is too difficult to read, visit the Beaver Index. Enter 'Marsh' in the Contributor field and 'caribou' in the keyword field. Click on the results and download the Adobe Acrobat version of this article. Read more excerpts about caribou - enter 'caribou' or 'hunting' in the search box to your left. Check the Beaver Index - e.g., caribou, hunting, survival, etc.